I am fixing it up and turning it into a mini tractor to use it to haul my cart around to pick up branches, mulch, dirt etc. I just touched it and it collapsed! Pulled out the deck and put it for scrap. Notice hole that I made is now even bigger. Powering it is a Briggs 19hp intek, a couple more HP than my old Troybilt. It has a dana 5 speed geared transmission! I read that these things eat input shaft bearings, so im pretty sure the bearings are gone. I’ll do a rebuild when the weather gets cooler. My old Pony. I kept it like new, but its all worn out and cant handle the huge yard. Engine runs like new and no rust! Sold it to someone that needs a mower. 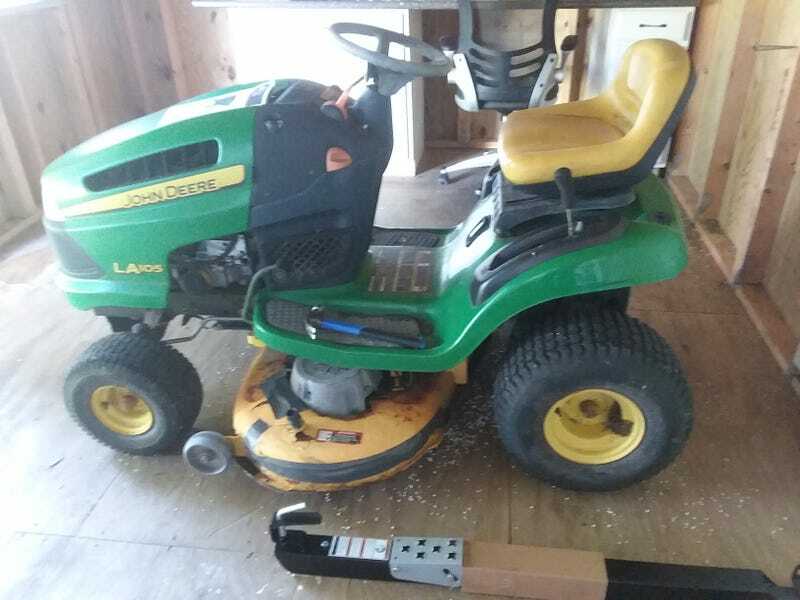 My new John Deere riding mower for my new property for those that haven’t seen my previous post. It’s a E130 V-twin 42 inch with a push bar and rear fenders!